Hadassah physicians transplanted human embryonic stem cells into the brain of mice who had multiple sclerosis (MS) and significantly slowed down the disease’s clinical symptoms and pathological manifestations. In MS, an autoimmune inflammatory disease of the central nervous system, the person’s immune system attacks the insulation material (myelin) of neurons. As a result, the nervous system is damaged and the patient suffers functional deficiencies in a number of neurological systems—sensory, motor, balance, sphincteral, and vision. While stem cells in previous studies were used to regenerate myelin, this time the cells were targeted to suppress inflammation. In this study, human embryonic stem cell-derived neural precursors were transplanted into the brain of mice with MS. The grafted human cells integrated in the mice brains and migrated toward the inflammation site. They suppressed the inflammatory process in the brain, thereby protecting the animals from damage to the myelin and nerve cells, the pathological hallmarks of MS. 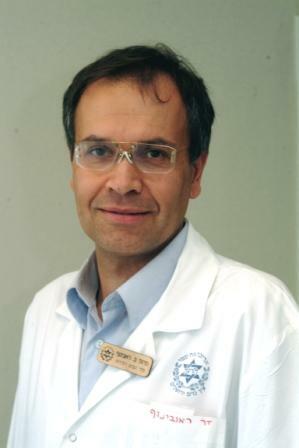 The study is a result of long-term collaboration between Prof. Tamir Ben Hur, Director of the Department of Neurology, and Prof. Benjamin Reubinoff, Director of the Human Embryonic Stem Cell Research Center. Other participants were Michal Aharonowiz and Dr. Ofira Einstein from Hadassah, and Prof. Hans Lassmann from the University of Vienna. The researchers believe that the encouraging therapeutic effects in the rodent model of MS pave the way for further developments, bringing the possibility of conducting clinical trials closer. Furthermore, they anticipate that the anti-inflammatory effect demonstrated here may be combined in the future with the use of human embryonic stem cells to repair myelin in the brain. Cell Cure Neurosciences, a subsidiary of Hadasit (the Hadassah Medical Organization’s research and development arm), will promote the application of the research findings. It is anticipated that clinical trials can begin in about three years. The study findings were published in the online Proceedings of the United States Library of Science One (PLoS One) in the beginning of September.